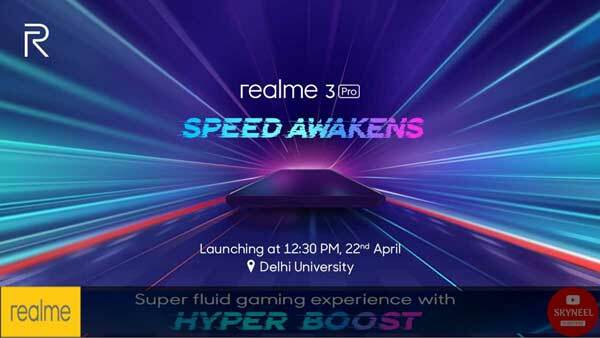 The Realme 3 Pro is going to be announced on April 22 at a press event at Delhi University in India at 12:30 PM. It may assume that Realme 3 Pro has been openly challenging Xiaomi’s Redmi Note 7 Pro. The Realme 3 Pro will have a 6.3-inch FHD+ display. There’s also a fingerprint scanner, Bluetooth 5.0, 5GHz Wi-Fi, and the battery’s capacity is rated for 3,960 mAh with fast charging support. Sheth tweeted and wanted to tell through the fact that this smartphone will be powerful in terms of performance and gaming centric users can buy this phone. Realme, which started work as a brand of OPPo, has acquired very good market share in the Indian smartphone market with in a short span of time. Now the company will launch latest smartphone in India. However, before the official launch of the smartphone, this device has spotted on the Gebatch and Bluetooth SIG website, which shows its specifications. Realme CEO Madhav Seth recently tweeted that the Realme 3 Pro will be much faster when compared to the Xiaomi Redmi Note 7 Pro. This suggests that the this smartphone may sport much powerful hardware when compared to the Redmi Note 7 Pro. This latest budgeted smartphone will comes with Snapdragon 710 SoC, running on Android 9.0 Pie along with ColorOS 6.0. Most of the smartphone not able to support fortnite games. As per report this smartphone support fortnite games. It is a good news for all gaming lovers. This upcoming smartphone is going to be announced on April 22 at a press event at Delhi University in India. The listing on the Geekbench website showcases a Realme phone with model number RMX1851. According to the Geekbench listing this smartphone will run on Android 9 Pie and pack Snapdragon 710 SoC, paired with 6GB of RAM. Further, the on-board connectivity options will include Wi-Fi, Bluetooth, fingerprint sensor and many more. Must Read: Realme U1 Vs Realme 2 Pro – Which is the better Smartphone? This smartphone is a mid-range device that comes with a powerful configuration that shows no sign of a glitch. The display is excellent which will allow the user to watch movies and play games with natural colour reproduction. Initial camera samples of the Realme 3 shared by Realme CEO Madhav Sheth. He also suggested the presence of HDR support and a selfie camera. It may assume that this smartphone has a resolution greater than 13 megapixels. This upcoming latest smartphone is directly marketed to compete against the Redmi Note 7 Pro. The Realme 3 Pro price in India hasn’t been revealed.